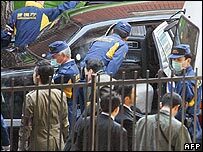 On February 5, Ryoichi Sugiura, a captain of the Sumiyoshi-kai—Japan's second-largest crime syndicate—was found shot to death in his car. Within hours, someone fired shots into the offices of the Yamaguchi-gumi, Japan's largest crime family. (You read that correctly: Japan's crime families maintain undisguised offices.) Two members of the Sumiyoshi-kai were arrested soon afterwards. On February 8, representatives of the two families met and apparently reached a peace agreement, with the Yamaguchi-gumi admitting fault. Then, on the 15th, the oyabun (godfather) of a Yamaguchi-affiliated organization, 70-year-old Kazuyoshi Kudo, was found dead of apparent suicide. Mr. Kudo's group, the Tokyo-based Kokusui-kai, had been aligned against the Yamaguchi-gumi from its founding in 1958 until 2005, when Boss Kudo switched sides and swore allegiance to the Kobe-based Yamaguchi-gumi. Yakuza experts cite this switch as proof of the Yamaguchi-gumi's intentions to expand into Tokyo, traditionally the Sumiyoshi-kai's turf. Authorities blame these expansion attempts as the cause of an upswing in yakuza-on-yakuza violence of late. What these guys need to do is have some green tea and mellow out.